Miranda Hayman is one determined woman. At the age of 17 she found herself on a surprise path to teaching dance and movement to people with special needs. Now, eight years later, Miranda is the proud founder of the Perform-Ability program and determined to do whatever it takes to get her team of 12 talented dancers to Florida, USA, to represent Australia at the World Latin Dance Cup in December. Miranda grew up in Newcastle, studied Musical Theatre at Brent Street in Sydney and did a year-long stint working at Universal Studios Japan. Throughout all of this, she has continued to run Perform-Ability – a performing arts program for people with special needs and disabilities. Now with a team of 12 teachers, she runs weekly classes in the Hunter, Central Coast and Sydney. Her students have a range of disabilities including Autism Spectrum Disorder, Down Syndrome and Global Development Delay.In July this year, her Central Coast dance group performed at the Australian Latin Dance Championships in Sydney and became the first ever Australian team to qualify and be invited to compete at the World Latin Dance Cup in Orlando, Florida this December 11-16. Entering two dance divisions alongside dancers with additional needs from all over the world, they will be competing in the Limitless Salsa and Bachata partnered team categories. Miranda wants to get the word out to everyone that opportunities like this are very rare in the disability community. Her students are so excited about going to Orlando but they need help to raise the $100,000 needed to take a team of 12 dancers and their carers to the US. This group of 12 have worked together closely for 3 years and it’s important they get to go as a team so that they feel entirely comfortable. For these performers, it can be very stressful not having their dance partners by their side on stage. Please enjoy our interview with Miranda Hayman below. Q: Tell me about how you got involved with Perform-Ability? I had been teaching at a dance school Newcastle since 2009, and one day we had someone come and join the class who had Down Syndrome and hearing impairment. This student came along to classes and was part of our annual concert and she just completely stole the show! She has such a hilarious personality and still with us… she’s been doing it for seven years now. She’s got almost better timing than anyone else in the school because she feels the bass through the stereo which just fascinated me. At this point, I knew absolutely nothing about people… I didn’t even have any friends or families with disabilities. So, this girl’s mum turned to me after the concert and said I needed to start a class with all special needs dancers because she and her friends didn’t have anywhere to go to dance that catered just for them. Somewhere that they didn’t just get shoved in the back row. Special needs dancers always get pushed in the back corner because people just assume that’s all they can do! They don’t get challenged and they don’t get any attention or guidance. So we started a little special needs class and it grew, and grew! Then I looked at doing classes with people in day services. I sent out an email to everybody stating that we’ve got no experience nor qualifications, but please come along for an hour of fun and games! We ran classes through The Samaritans, Life Without Barriers, House With No Step, Devon and more. So it just grew quickly by word of mouth, we learned on the job, and we asked a lot of questions. We ended up creating our own special needs dance program and have a team to run it. Q: Where do you run the classes? We have a team of 12 now based in Newcastle, and we run classes in the Hunter, Central Coast as well as two classes in Sydney each week at day service programs in Botany and Marrickville. Q: Tell me about the group you are trying to get to the USA to compete in the World Latin Dance Cup. It’s the Central Coast dance team that placed first at the Australian Latin Dance Championships and qualified to represent Australian in Orlando, Florida, at the World Latin Cup in December. They will compete in two dance divisions alongside dancers with additional needs from all over the world, competing in the Limitless Salsa & Bachata partnered team categories. This amazing group started three years ago. We were just doing basic jazz and a little hip-hop. But from the get-go they didn’t want to play games, they just wanted to do a mainstream dance class and they want to be pushed and learn proper technique. They’ve just always been driven to learn a lot more than recreational dance. They’ve done dance eisteddfods and a lot of performances… they’ll take up any opportunity to perform! Amazingly, many eisteddfods and competitions have started to include sections specifically for dancers with special needs, which is great! They are an incredibly talented group with great personalities. Q: So you’ve got 12 students from age 7-23… How did they end up doing Latin dance style and competing in it? One of the studios I hire is a Latin dance studio. I got to know the owner and staff and I ended up becoming a dance partner at one point. Then I found out that one of his staff works with people with disabilities. So I got him onboard my Perform-Ability team straight away. He was the one who suggested we teach them partner dancing because it’s so great for people with special needs to use their social skills and form trust in each other. It also happened to be around the same time that the Australian Latin Dance Championships were coming up. Coincidentally, the person who runs the Australian Latin Dance Championships also runs the Central Coast Disability Network. So we put two and two together and suggested to the owner of the competition to start a special needs section in the dance championships. We asked our dancers if they wanted to try some Latin dancing and possibly do a competition and their answer – as always – was yes! It’s been such a challenge for a few of them who wouldn’t usually feeling comfortable doing a partner dance or not quite have the social skills that others do. But they’ve just fallin in love with the style and they love the partner work. Q: So, this particular dance group was invited to go to Orlando to represent Australia, and you are now raising funds to get them there? Yes; We started a Gofundme fundraiser page straight away which is now up to $9,500. We’ve also done chocolate boxes, pie drives and trivia nights to help get us to our goal of $20,000. To take 24 people away on the trip it will cost just under $100,000. Q: Tell me a little about the dancers you have on your performance team. In this particular group we have people with autism, people with down syndrome and some with global developmental delay. We have an equal mix of female and male dancers, with the youngest being just 7 tears old! We are the first Australian team in Australia to perform in the special needs division. We’re also the first team in the world to have anyone under the age of 18 in the division. Q: After the US show, where do you want to take Perform-Ability next? About 5 years agao, I got to the point where I was poutting a lot of time into it and ecided to create my own program. So now I am oputting in place structures and hope to franchise the program so it can be delivered to people with special needs everywhere. I am especially keen to see it happen in country and rural areas where they are screaming out for activities. 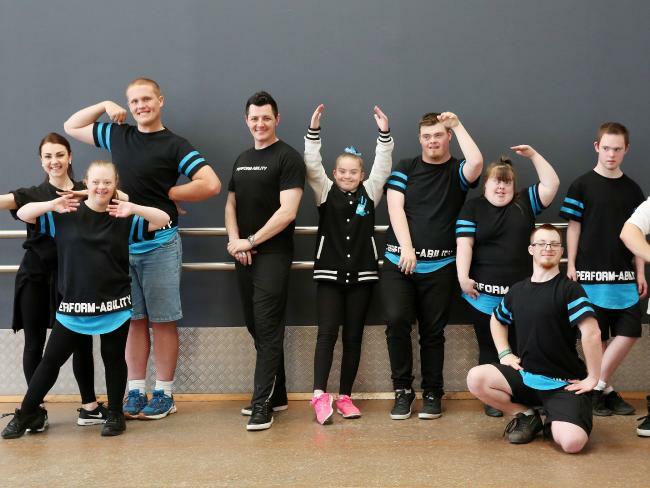 STUDENTS of Medowie's Perform-Ability class were among the 98 performers at the special needs dance and drama group's first ever concert last week. Patrick Muller, Tim Low, 14, Mitch Low, 14, Riley Briggs, Maddy Petith, 13 and Tiffany Moul-e, 14, from the Medowie class took part in the concert, held on September 23. "Watching our clients blossom into performers was so incredible to witness," said Miranda Hayman, the founder of Perform-Ability. "We had performers who have never performed before and just didn't want to leave the stage. "We hope this is just the beginning as we would love to continue to put on annual concerts, making them bigger and better every year." ROUSING: Tim Low, 14, Patrick Muller, Mitch Low, 14, Riley Briggs, Maddy Petith, 13, and Tiffany Moul-e, 14, from the Medowie Perform-Ability class. 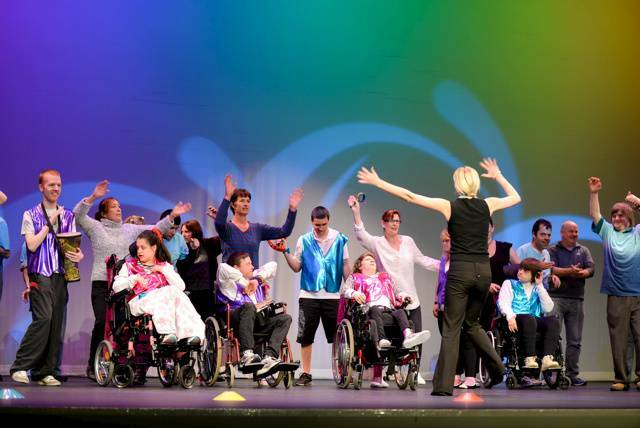 Perform-Ability is a dance, drama and music program for people of all ages with special needs and disabilities. Classes are held across the Hunter including Maitland, Medowie, Newcastle and Belmont. The concert was a Perform-Ability initiative and was pulled off using funds raised from friends and family of the performers and donations from small businesses. Kinetic Creations donated $500 worth of made-to-measure costumes for the performers. About 250 people turned out to St Philip's Christian College in Waratah to watch the performance. "There was impromptu performances from excited clients, tears of joy from our staff and the audience and such a beautiful warm vibe in the theatre the entire performance," said Ms Hayman.